Our Footman's Tower Shield for LARP is made from extremely durable foam that does not shred and sealed with a strong coating of latex. Safety is always an issue in LARP, that is why these have a round flexible fiberglass core with strong Kevlar core tip protection. 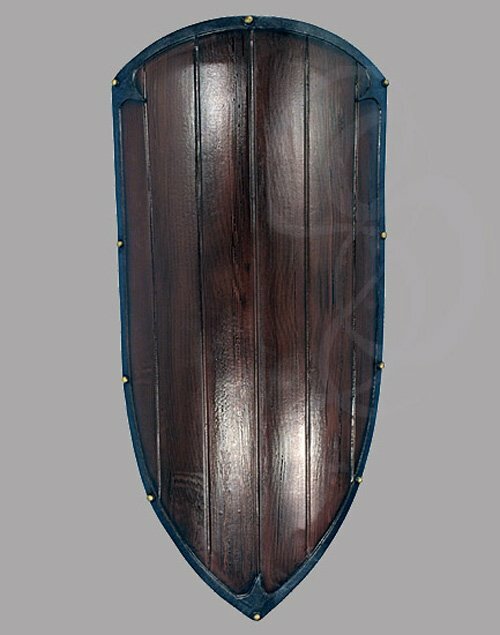 This large shield is sure to fully protect your front from any sword blows and even good for blocking LARP arrows. The shield has a realistic wood grain finish. This shield has a vertical handgrip. Latex shields do need to be maintained to a certain degree. We offer a Maintenance Silicone that can be purchased separately in the LARP Accessories section. We recommend you use the Silicone on a regular basis, it is a easy, spray on application. The silicone will keep the coating flexible and make the shields last much longer. The maintenance silicone protects the coating from drying out, and helps the shield resist wear and tear.